This week's highlight taxon is the Aquificae. Aquificae is a smallish group of thermophilic to hyperthermophilic bacteria whose main claim to fame is that ribosomal DNA phylogenies suggest that it is the earliest-diverging branch of the Eubacteria, making them a key player in the theory that life as a whole may be descended from a thermophilic ancestor. The type genus of the Aquificae, Aquifex (A. aeolicus shown above in an image from here), was only formally described in 1992, but the numbers have swelled since then to about fifteen genera divided between three families. Because their thermophilic habits make them difficult to culture, the diversity of Aquificae is almost certainly underestimated. Environmental molecular analyses, for instance, indicate that near neutral pH terrestrial thermal springs may be dominated by Aquificae, while examples of Aquificae have been isolated from deep-sea, shallow marine and terrestrial hydrothermal systems, subsurface mines, and even heated compost (Aguiar et al., 2004). Aquificae found in thermal springs form extensive microbial mats stained black or yellow by iron or sulphur mineral deposits, leading to their being referred to as "black filaments" or "sulphur-turf". Aquificae are all chemolithoautotrophs - that is, they produce their own energy directly from the reaction of inorganic sources. This is acheived through the oxidation of molecular hydrogen, which is a major component of emissions from deep-sea hydrothermal vents. Aquifex reacts hydrogen and oxygen to produce water, while other species of Aquificae use such substrates as elemental sulphur or nitrates as electron acceptors. Hydrogen oxidation is a common metabolic process in archaebacteria, but is unusual in eubacteria - the only hydrogen-oxidising eubacteria other than Aquificae belong to the ε-proteobacteria. Aquificae may be anaerobes or microaerophiles. 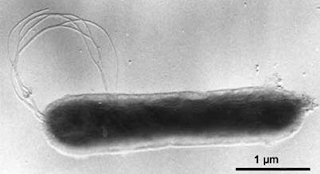 Microbial filaments containing Aquifex growing in water at 83°C (from MicrobeWiki). Phylogenetically, Aquificae are actually something of a puzzle. As already noted, the ribosomal DNA phylogenies place the Aquificae basal to all other eubacterial groups. However, it has been fairly conclusively shown that the eukaryote section of the rDNA tree is quite severely compromised by long-branch attraction, and it is quite possible that the bacterial section of the tree suffers the same problem. In the case of the Aquificae, there is evidence that they may not be as basal as they appear. Bacteria can be divided into two major groups, the Gram-positive and Gram-negative bacteria. While this originally referred only to the ability of the bacterium to be stained with Gram's iodine and crystal violet, the results actually reflect a far more fundamental distinction between the two groups. Gram-positive bacteria have a single cell membrane surrounded by a thick cell wall. Gram-negative bacteria, on the other hand, have a thinner cell wall with a second membrane overlying it. Many molecular phylogenetic trees also show a sort of rough division between the two groups, with Gram-positive bacteria tending to sit closer than Gram-negative bacteria to the archaebacteria and eukaryotes, which like Gram-positive bacteria have a single cell membrane. Gupta (1998) formalised this distinction by dividing prokaryotes between the Monodermata (Gram-positive bacteria and archaebacteria) and Didermata (Gram-negative bacteria), suggesting only a single loss or gain (depending on where exactly the root of the tree of life sits) of the second cell membrane. Aquificae, however, are Gram-negative, complete with second cell membrane. If their position on the ribosomal DNA trees is accurate, this would require either that the outer membrane was gained or lost multiple times. If the membrane gain or loss was a unque event, then Aquificae must be closer to the other Gram-negative bacteria. Cavalier-Smith (2002) placed Aquificae in a position within or near the Epsilonproteobacteria, as suggested by RNA polymerase and a few other molecular phylogenies. As already mentioned, it is notable that ε-proteobacteria include the only other hydrogen-oxidising eubacteria (Takai et al., 2003). Insertions in the alanyl-tRNA synthetase and RNA polymerase β genes also support a position for Aquificae among the other Gram-negative bacteria, possibly close to the Proteobacteria. It seems possible (though it must be stressed that it is far from well-established) that the rDNA tree has been compromised by long-branch attraction, probably due to the high G+C content of the Aquificae genome, which is itself believed to be an adaptation to a thermophilic lifestyle. Aguiar, P., T. J. Beveridge & A.-L. Reysenbach. 2004. Sulfurihydrogenibium azorense, sp. 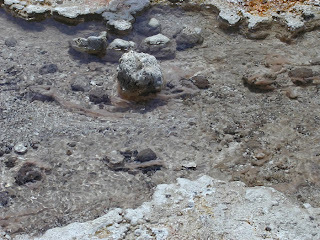 nov., a thermophilic hydrogen-oxidizing microaerophile from terrestrial hot springs in the Azores. International Journal of Systematic and Evolutionary Microbiology 54: 33-39. Cavalier-Smith, T. 2002. The neomuran origin of archaebacteria, the negibacterial root of the universal tree and bacterial megaclassification. International Journal of Systematic and Evolutionary Microbiology 52: 7-76. Gupta, R. S. 1998. Life's third domain (Archaea): an established fact or an endangered paradigm? A new proposal for classification of organisms based on protein sequences and cell structure. Theoretical Population Biology 54 (2): 91-104. I'm out of my depth here, so I don't know if this is a dumb question, but might lateral transfer also have something to do with this? Also, has anyone proposed a potential test (however difficult to perform) to distinguish whether terrestrial life was originally extremophilic or if "primitive" forms tend to survive in extreme conditions due to the lack of competition? IIRC, it has also been suggested (though I can't recall the references) that Aquificae and Thermotogales, the two thermophilic groups that are basal on the bacterial rDNA tree, have both received a lot of genes through LGT from thermophilic archaebacteria, which may also affect their phylogenetics. Attempts have been made to reconstruct the genome of LUCA (the Last Universal Common Ancestor*) by tracking back shared features through the phylogenetic tree (there's a Nature newspiece here, if you can get it). Some of these studies have supported a thermophilic ancestor, but needless to say, there'd be a lot of controversy over the methods used for such a study, and if the tree you were using was invalid, then you'd probably get the wrong result. *I'm sorry, but I can't read that name without a little voice in my head saying, "My name is LUCA, I live on the second floor..."
The frustrating thing about bacterial phylogenetics is that it all becomes very circular, very quickly. The root of the universal tree of life could be damn near anywhere among the prokaryotes. We can't even say whether there is such a thing as a single root, or if LGT means that something more complicated is involved. And if we don't even know such basic things, it becomes difficult to talk about anything more derived.